See my Musecore e-course page for information the context of this assignment. It may be helpful to watch musescore's "getting started" videos before doing these assignments. Download MuseScore if you haven't already. Open Musescore. Go to "File" and create a new document. 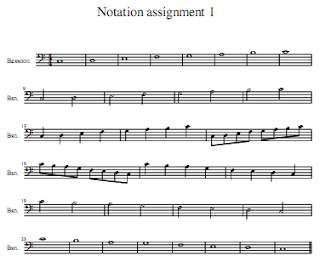 In the title space type "Notation assignment 1" Leave the rest blank unless you want to have fun with it. Click "next". Pick a one-stave instrument. I chose the bassoon under woodwinds. Click on the bassoon and then click on the button that says "add" in the center column. Click "next". You will see key signatures. Leave it on the "C" default (no sharps or flats) and click next. Leave the default time signature at 4/4. Under the number of measures, type in 15 and click "finish". Type "N" and look in the bottom corner of the file and look for "note entry mode". There will be nothing written if you are not in note entry mode. Finish the scale by typing "D E F G A B C"
Press "6" to highlight the half note. Type "C" then ctrl+down to make another base-C. Finish the half note note scale by typing " D E F G A B C". Press "5" to highlight the quarter note. Type "C" and ctrl+down to make another base-C. Finish the half note note scale by typing " D E F G A B C". Press "4" to highlight the eighth note. Type "C" and ctrl+down to make another base-C. Finish the half note note scale by typing " D E F G A B C". At this point we decide that we want more measures. Use your mouse up in the file menu and click on "Create". Mouse over "measures" and click on "append measures" (the second one down. Type "15" and click "okay". Make sure that you are still in Note entry mode. Select the eighth note by pressing "4" or click on the eighth note with your mouse. In measure 16, mouse over middle "C" and click to create the note. Finish the scale by typing "BAGFEDC". Press "5" to select the quarter note. Type "C" Now we need to make the note jump up an octave. Press ctrl+up to work the magic. Finish the scale by typing "BAGFEDC". Press "6" to select the half note. Type "C" Press ctrl+up and finish the scale by typing "BAGFEDC". Press "7" to select the whole note. Type "C" Press ctrl+up and finish the scale by typing "BAGFEDC". See the palettes on the left and click on "Breaks and spacers". Three green pictures will be there, select the first and drag it to the end of your first scale, the middle C, and let go. This should make the half notes go to the next line. If you let go in the wrong place, click ctrl+Z to undo it and try again. 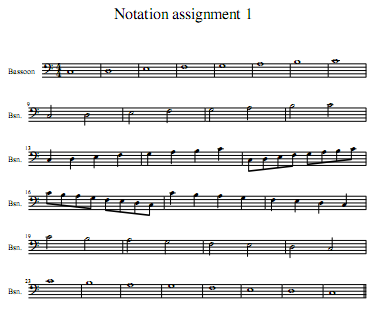 Repeat at the end of the half note scales and eighth note scales to make the formatting look more pretty. Your finished assignment should look like this. This is great! Thanks so much for sharing this resource and guiding us through it. Ive downloaded and started the first assignment. I love it and I think we'll have lots of fun with it. Note: If you're using musescore on a Mac, use the command key instead of control along with the up/down arrow buttons to change octaves. Psst! It's okay to celebrate after the holiday.